When was the last time I did a morning-after concert review? Been a while, so thank the early start time at the Mod Club last night (and the fact that I had nothing else ready for today). As previewed yesterday, last night was the start of the Scandinavian invasion of Canadian Music Week, with Denmark’s Under Byen and Sweden’s Frida Hyvonen in town and sharing a bill with Toronto’s Ohbijou. The locals opened things up and as with each other time I’ve seen them, they were wonderful. Though the difference between calling them “chamber pop” and “orch-pop” seems academic, the distinction is evident when you compare their record Swift Feet For Troubling Times (the former) with their live show (the latter), the respective differences enough to make both required listening/seeing. Onstage, even when saddled with an overly muddy mix as they were last night, they were nothing less than beguiling – a swirl of strings, horns, guitars, keys and creative percussion topped with sweet vocals. No cover of “Heartbeat” this time but as always, a delight. 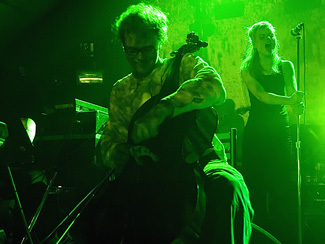 Though the stage was a veritable sea of musical equipment at the start of the night – both Ohbijou and Under Byen come heavily equipped and must be a roadie’s nightmare – most of it was cleared off, save for a single keyboard, for Frida Hyvonen. And even alone onstage and at an angle with her back facing much of the audience, she was mesmerizing. Dressed in a light coloured dress (with pockets) which combined with her beyond-fair complexion and platinum hair made her look like an apparition, her personality veered from loopy to almost maniacal in chatting with the audience in between performing songs from Until Death Comes (which is also equal parts loopy and manic), yet always entertainingly so. And just when you were convinced this woman was completely off her nut, she’d pull out a ballad of such remarkable beauty that your head would spin and your heart would break. As much as I enjoy the record, I certainly didn’t expect her set to be so much fun. But she was. And it was good. As much as I enjoy the recording of Samme Stof Som Stof, it was seeing Under Byen at last Fall in Montreal that really drove home how good and unique this eight-piece is and sealed the deal for me as a fan. The lineup seems to have changed a bit since that show in October, but they were every bit as sonically devastating last night, probably even more so. Achieving volume by means of layers and layers of instrumentation and not by simply turning amps up (though having two drummers going full tilt certainly helps raise the noise floor), Under Byen offered a fresh and exciting take on what one might reductively call post-rock though that really doesn’t do their art justice. Their set comprised Samme Stof material and a fair bit that I didn’t recognize, but they’re not exactly a band that needs to air out the hit singles to satisfy – just by sheer force of performance they could win over a total newcomer and I wager they did just that last night. So, so good. Billboard talks to Feist about her new album The Reminder, out May 1. She plays Massey Hall on May 26. From Blown Speakers is reporting that Metric’s long-lost (yet not hard to find if you know where to look) first album Grow Up And Blow Away will be getting re-released this Summer, though I don’t know if that’s the right term since it wasn’t really released the first time around. What I’ve heard sounds almost a world away from their current synth-rock sound so it’ll be interesting to see how it’s received. Also, Uberdrivel has a live Metric set from 2005 available to download. Looking forward to seeing Land Of Talk at the ‘Shoe tonight. Filter just posted the schedule for all of their shows at SxSW next week, and they’re managing to squeeze a remarkable seven performances into their four days in Austin. The one to see, of course, will be at Hot Freaks on Saturday, 1:30PM at the Mohawk. The preceding five shows are just warm-ups. Yeah. Frida Hyvonen was hilarious. I enjoyed her much more than I thought I would. I wish I could’ve stayed for Under Byen’s full set, but alas…I’m happy that the rest of my night was at least worth leaving early for. Very good show, and good pictures as always. More of the artists drinking red wine during the gig than I’m used to. I was hoping that you’d follow up on Frida’s invitation to jump on stage to snap a few pics! Under Byen were amazing, I wasn’t so much into Frida but I’m sure it wasn’t for me. Ohbijou were just ‘OK’ for me as well, maybe they had an off night. Oh wow were Under Byen fantastic yesterday! I wish their vocalist would stand out at the front of the stage though(although the way she stood behind some of the band makes for a nice photo above). The way the vocals, percussion, strings, keyboards, and other instrumentation came together combined with the great screen projections/light effects…amazing. BTW, if I don’t run into you at any other shows this weekend, have a great SXSW. i haven’t seen Under Byen live but I find their recordings very cliche "scandinavian", sounds very similar to a lot of stuff coming out of there. That said I’m interested to see them live, from various accounts I’ve heard they were pretty good, although they’ve apparently been booked in venues far too big for their popularity for it’s been steady evenings of over half empty rooms. Tis a shame to come so far …. I first saw Metric in, hrm, 2001, I think.. I believe they were opening for The New Pornographers (with Death From Above in between, before DFA became DFA1979 and then nada)… and I recall really liking Metric and spent the next couple of years looking for an album from them.. they had a Ladytron-esque vibe to them, I think (the memory is really fuzzy) and invariably when I bought Metric’s Old World Underground I was disappointed because they didn’t sound like I remembered them. I still don’t like them as much as I did after I first heard them, but I also don’t actually recall anymore what they sounded like.